I must admit, I have nothing to write. However, I will make an effort to write something because I hate going to a blog post and it’s just a recipe. 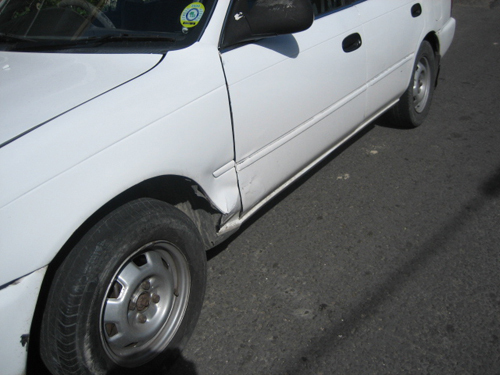 So in attempt at not doing the very thing I hate, I will about a car accident I cause exactly 2 years ago in Antigua. Trust me, it wasn’t serious. Before you say I should have known better than to try to drive in a country that drives on the other side of the road and the are seriously narrow, I agree! But it wasn’t my fault. My older brother Kimani was supposed to drive into St. John and pick up my aunt and cousin and then drive back to work. From there I would take the wheel, which was a short 10 minute drive out in the country. That’s what was supposed to happen. What did happen was my brother drove to his job first, jumped out of the car and said “See ya”. As much as I loathed the idea of driving into town, I didn’t want to appear like a sissy, so with my pregnant cousin Kanema in the front seat we were on our way. While she cheered me on, I meandered through the tiny streets until I arrived at my Aunts’. We celebrated with high fives. That didn’t last very long. With my Aunt in tow, we began our trek to the beach. 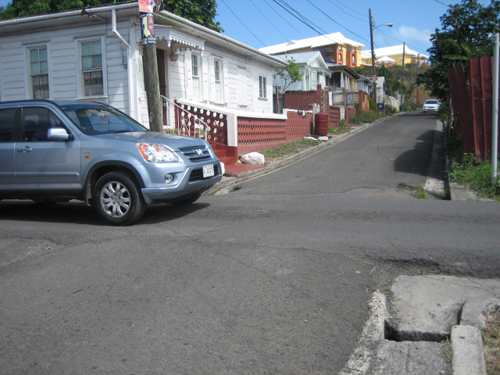 While driving down a seriously narrow street, there was a driver parked on the left side. My first thought was “How in the heck am I supposed to pass this guy? ?”, but I figured since the driver ahead of me passed, then so could I. What I had overlooked was the driver ahead has probably spent his entire life driving through these street and was equipped with a natural ability to wedge himself between that car and the ditch on the right. And I had not. As I attemped to pass the car there was a loud bang and we were unable to go any further, I completely miss averaged and slammed into the side of the car. The driver who was sitting in his car immediately jumped out and started to scream and shout and berate me. I kept quiet and tried to calm him down, after all I was driving in a foreign country without a drivers license. We stood on the side of the road for what seemed like hours, waiting for my brother’s friend to come and resolve the situation. When it was all over, the worst part was I still had to drive home. Needless to say I never made it to the beach that day. The End. Enjoy the Chicken. Place all ingredients in a bowl and mix to coat chicken well. Place in fridge for at least 4 hours. Preheat oven to 400 degrees. Place chicken on a foil lined pan with at least 1 inch of space between the pieces. Bake for 50 minutes. I don’t eat chicken but my guy does. I will have to try this for him. The picture looks delicious! I love the paper thin cucumber accompaniment. Are they spiced too? I just pour a bit of white vinegar with salt and black pepper over the cucumbers. Hahaha, that sounds like a really terrible day, but the chicken looks delicious! WOW… baked curry! Haven’t tried that yet but it makes sense! Will try some time. Thanks for something fresh! oh man this looks so good. I wonder how that feels to drive on the opposite side, wow! With so many expensive spices, I was looking for different variations of preparing curry chicken. 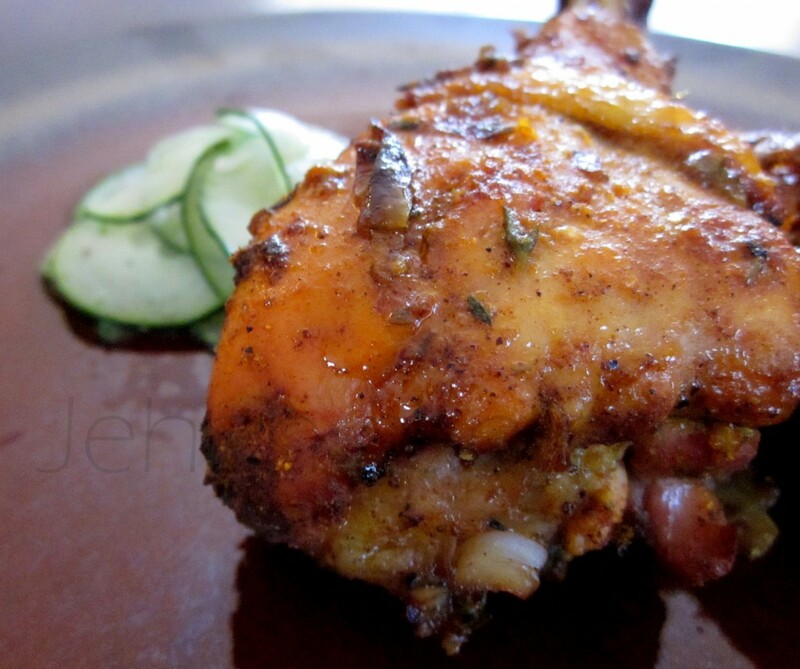 Specifically oven-style curried ckn legs. Hey, this is AMAZING! I followed the recipe pretty precisely (well I did use Red Curry Powder because it was fresher than the other I had and I used five legs). 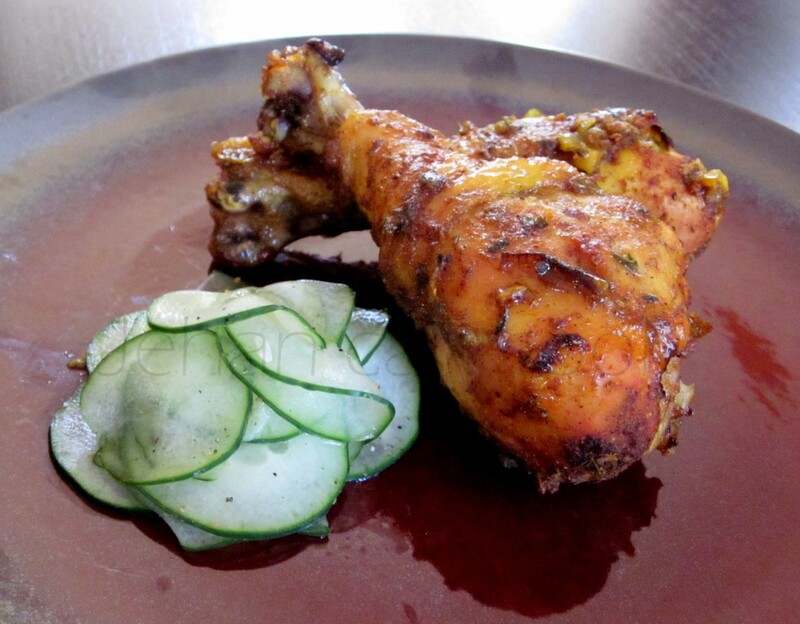 Let me tell you how beautiful the marinade….WOW! and how fragrant…WOW! We did not cook until the next day. The aroma just got better. The flavors meld really well and the skin was so absolutely crisp. I had to show my family where the recipe originated. Hugs from us. Oh, just one other thing: I think in the future I’ll choose to marinate at least 8 hrs up to 24. This was infused with flavor. We are using drumettes so how long do those cook for? 35-40 minutes should work for the drumettes. Is there a particular brand of curry you prefer? Iris I use a few brands, Chief or Chatak are a few that are easily available here. I also make my own curry mix.